“Bricks and feathers” describes the two primary types of content marketing. Bricks are hefty. Bricks are permanent. Bricks require more production time. Bricks are saved, shared, or printed. A webinar is a brick, for example. Feathers are lightweight. Feathers are ephemeral and somewhat disposable. Feathers are easier to create. They are noticeable but less persuasive than bricks. This blog post is a feather, for example. 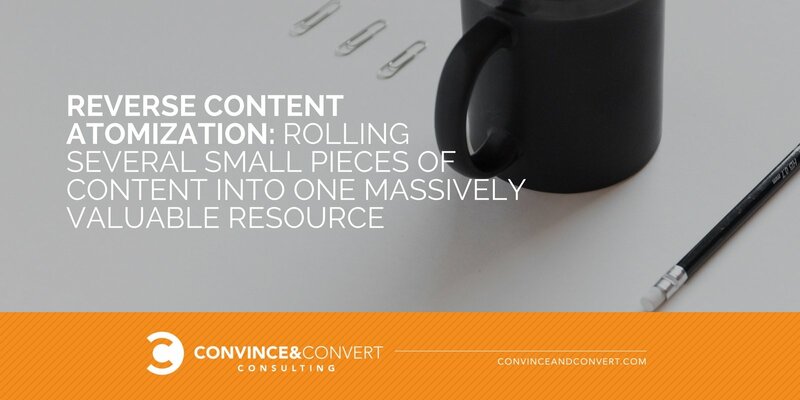 “Content atomization” (coined by Todd Defren) means taking your content marketing “big idea”—usually a brick of some sort—and deconstructing it into a series of smaller feathers. This gives you more juice for the squeeze, increases the efficiency of your content creation efforts, and allows the brick premise to live in multiple places and formats (social media, for instance). Typically, we advise a one-to-eight ratio for atomization. That means you should repurpose and repackage each brick into at least eight feathers. Last week, I was sent a very interesting example of content marketing from ManageFlitter where the atomization process was turned on its head. Instead of splitting a big idea into a bunch of smaller executions, they took a large batch of feathers and rolled them up into a brick. Here’s how they did it. #SocialROI is a recurring Twitter chat that takes places each Tuesday at 5 p.m. ET. This weekly feather is hosted by consultant and Twitter expert Madalyn Sklar (who was a great guest on my Social Pros podcast), who is joined by a special guest. But, like all good Twitter chats, the tuned-in community participates significantly too, asking and answering questions with aplomb. 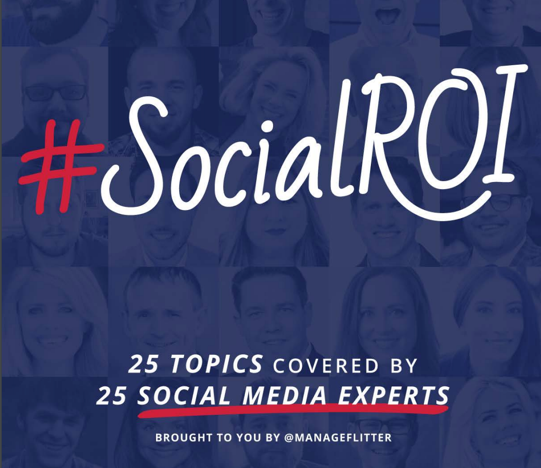 The Australian Twitter optimization software firm ManageFlitter is the exclusive sponsor of #SocialROI, and this reverse atomization system maximizes the value of their sponsorship. Feather: Each week, ManageFlitter posts social graphics on their accounts promoting the show and that week’s special guest. Join us today for the #SocialROI Twitter chat hosted by Madalyn Sklar with guest Shaun Ayala. Feather: At the conclusion of each chat, Madalyn conducts a Facebook Live chat with the guest, amplifying the episode and providing a cross-channel boost. 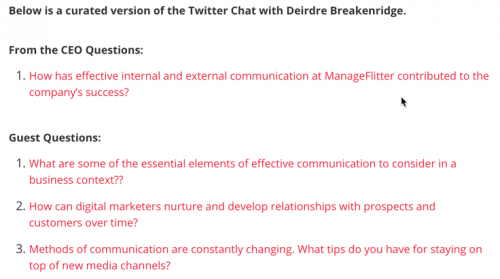 Feather: Approximately 72 hours after each chat concludes, ManageFlitter posts a comprehensive recap blog post that includes all questions asked of the guest and the best answers from the community. Feather: ManageFlitter cross-posts the Facebook Live videos to their YouTube channel as a playlist just for #SocialROI. The ebook is very interesting. Lots of good perspectives, and an excellent example of reverse content atomization. I’m sure I didn’t invent reverse atomization, but I first took a stab at it when I launched my own Twitter-based interview series in 2008, called Twitter 20. Joseph Jaffe was my first guest on the show, and after a few dozen “episodes,” I rolled them up into a Slideshare download, just like what ManageFlitter has done here. 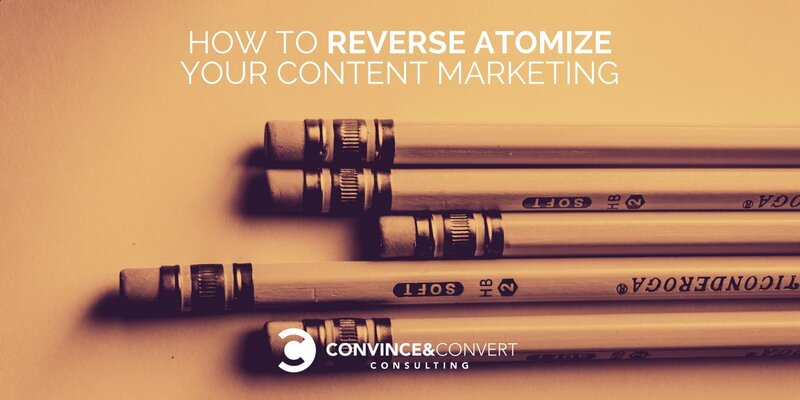 Great to see that content extension through atomization is alive and well! 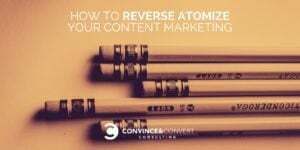 If you’re not pursuing a one-to-eight or eight-to-one strategy, start thinking about atomization in your content marketing planning process. It will help you a lot.